The Utes used timely plays from the offense, defense and special teams to upset Stanford. 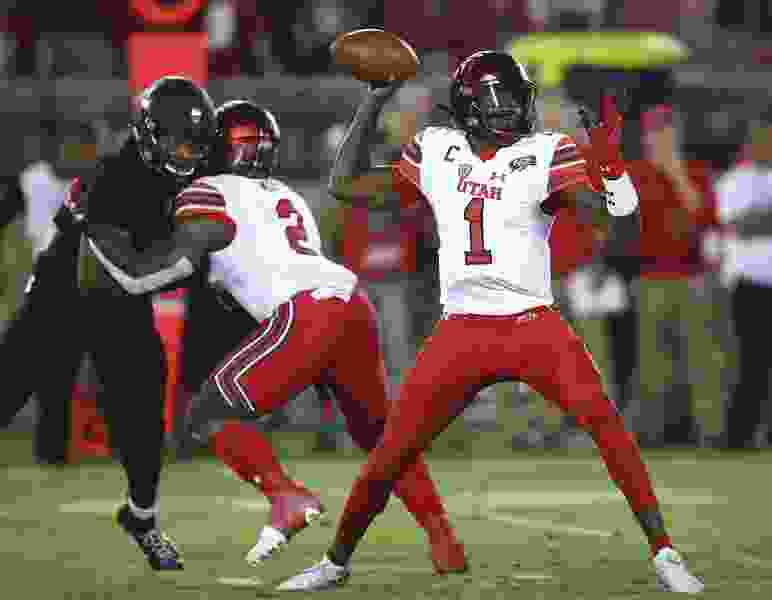 Palo Alto, Calif. • Utah quarterback Tyler Huntley strode into the interview room late Saturday night and delivered answers in the form of questions. They’ve improved, judging by Utah’s 421-yard offensive effort in a 40-21 defeat of then-No. 14 Stanford, with the Ute defense providing one touchdown. That covers Huntley’s two subjects. The bigger issue is how the overall view of the Utes changes, now that they’ve beaten a Top 25 team for the first time since 2015 and broken an eight-game losing streak against Pac-12 North opponents that covered parts of three seasons. This victory allows the Utes (3-2, 1-2) to think of themselves as Pac-12 South contenders, launching a stretch of four games against division rivals Friday vs. Arizona at Rice-Eccles Stadium. The compressed schedule made coach Kyle Whittingham say he was giving himself “about 12 hours” to enjoy the win. Fans can savor it longer, and there was a lot to like. Utah stormed to a 21-0 lead, wobbled in the third quarter with its lead cut to 27-21 and then ended the game decisively, unlike the previous weekend at Washington State. “It’s just a matter of putting things together and it’s a matter of finishing,” receiver Britain Covey said. ESPN’s Football Power Index now projects 8.0 wins for Utah, up from 6.7 as of last week. Whittingham is 3-1 against Stanford’s David Shaw, who has won nearly 80 percent of his games in eight seasons. • Utah’s offensive scheme actually works, when properly functioning. If the Utes are running effectively with Zack Moss and Armand Shyne, plus a dose of Huntley’s keepers, it all comes together. Utah produced points on seven of nine drives, prior to kneeling at the end. Offensive coordinator Troy Taylor cleverly varied his play-calling, and he could do so because the Utes were staying on schedule in down-and-distance sequences. That’s vital to Utah, almost like an option team. Utah went 6 of 13 in third-down conversions; the successful plays came with an average of 3 yards to go. • Utah’s secondary temporarily has lost any right to be considered the best group in school history. That’s strange to say after Jaylon Johnson’s 100-yard interception return for a touchdown. Then again, thanks to Hauati Pututau, Ute defensive tackles still have as many pickoffs (two) as the defensive backs. Giving up 445 passing yards to Washington State was more forgivable than allowing 381 passing yards to a Stanford team that was missing star Bryce Love and still viewed itself as a run-oriented team. The Cardinal had three 100-yard receivers. • Matt Gay is back. The reigning Lou Groza Award winner had two field goals blocked, missed another and made only four kicks in the first four games, but he was outstanding at sea level Saturday. Gay’s ability made Whittingham play aggressively at the end of the first half, and the strategy worked. The Utes covered 44 yards in 22 seconds, with freshman tight end Brant Kuithe making a big catch that led to Gay’s 48-yarder. He added field goals of 49, 34 and 37 yards. Moss. Utah will have strong candidates for the Pac-12 defensive and special teams player of the week awards. Even if Moss' 160-yard night was standard stuff from a league-wide perspective, though, the Utes needed everything he gave them. Runners-up: Multiple players have to be mentioned — Huntley, going 17 of 21 for 199 yards; defensive end Bradlee Anae, with two sacks and a forced fumble that basically ended the game, plus a throwdown of receiver Michael Wilson on Stanford’s reverse that looked promising; and Gay, looking automatic again. Johnson’s 100-yard return created at least a 10-point swing, as he undercut a route and sprinted down the sideline toward the Ute fans — who accounted for a remarkably high percentage of the crowd — in the southeast corner of Stanford Stadium. Johnson’s only thought? “Don’t get caught,” he said, after running away from Cardinal quarterback K.J. Costello. Johnson helped the Ute defenders produce four takeaways and a touchdown; “four and a score” is their goal in any game. Runner-up: Huntley’s 57-yard pass to Samson Nacua. His first touchdown pass in four games was vital, giving Utah a 37-21 lead after the defense finally made a stop. Under pressure, Huntley somehow fired the ball toward the sideline. Nacua adjusted well and made the catch, then ran to the end zone after the defender fell. Arizona comes to town after a 24-17 win over California that was driven by two pick-sixes in the second half. Cal posted 476 yards to Arizona’s 265, but the Wildcats rallied with big defensive plays after being down 14-10 at halftime.